When you ask your girlfriend to marry you, she'll be looking directly into your eyes. After that, they'll go to the ring. 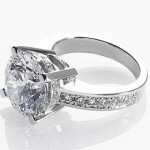 Your options of diamond engagement rings are voluminous, so here are some tips to select just the perfect ring. Start by thinking of your future fiancé and not the ring. Keep in mind this will be a ring she'll wear every day for the rest of her life. So if you haven't before, start paying attention to her personal style. How does she dress? What kind of jewelry designs has she bought for herself? You probably have a number of photos of her on your phone, so don't be shy about showing them to the salesperson if you still feel uncomfortable trying to describe or translate her style. The salespeople are trained to assist you in narrowing down to the right style. You should also keep in mind how active she is. A ring design that pushes a large stone high above the hand might get in the way for a woman who engages in a lot of physical activities. Never more than you can afford. So while there are rules of thumb like two or three months of your gross annual salary, only go by that if you can truly afford it. 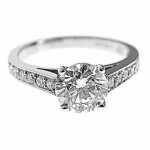 It is perfectly acceptable to decide that you'll pay the ring off over time, rather than need all the money upfront. The best advice regarding price and selecting engagement rings is to set your budget before you start shopping and then keep to it. 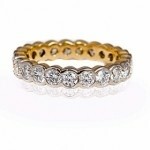 Salespeople will show you beautiful diamond rings that are outside of your budget, don't get distracted. You can politely remind them of your budget. If a salesperson won't respect that, you should move on to a different jewelry shop. Women are impressed with a good ring, but as a future husband, she'll be even more impressed with your financial responsibility. How Do You Select a Quality Diamond? If you've started thinking about buying a diamond engagement ring, you've probably heard of the four Cs already, but what do they really mean as you make your selection? · Color: Typically, this means how white a diamond is. The whiter the diamond, the more valuable it is. A diamond's white color is graded on an alphabetic scale from D to Z, with D being the purest white. 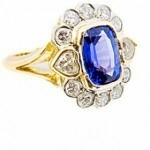 However, colored diamonds are becoming more popular. If you want a naturally colored diamond (say pink or yellow), these are quite rare and will be more expensive than a white. · Clarity: This refers to visibility of flaws within the stone called "inclusions." Keep in mind that most flaws aren't visible to the human eye. So this is one C where you can save some money. 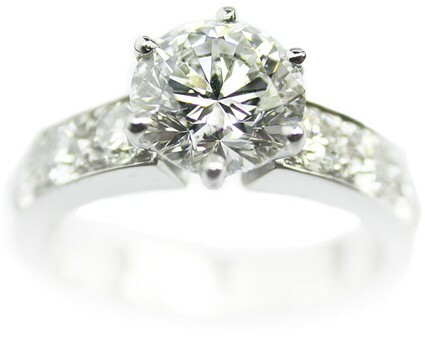 If you like the sparkle of the stone, don't worry so much about its official clarity grade. · Carat: Diamonds are weighed in carats, so this represents the size of the diamond. Remember that a higher carat diamond that is less expensive than a smaller one is so because it's a lower quality diamond when considering the other three Cs. · Cut: This is the area, along with the band design, where your girlfriend's style really comes into play. This is the shape of the diamond. Popular cuts for diamond engagement rings include emerald, pear, marquis, and oval. Take your time with this decision. You spent a lot of time selecting the right woman, so use these tips to make sure you select for her the perfect diamond engagement ring.